After more than five years of operating out of a 1600 square foot storefront in the Funk Zone, the Youth Interactive (YI) organization moved to a 13,000 square foot space on State Street in October 2018. Walking into the new YI location is awe-inspiring. When entering through the front doors, visitors will find a retail shop filled with artwork and merchandise created by YI program participants and other local artists. 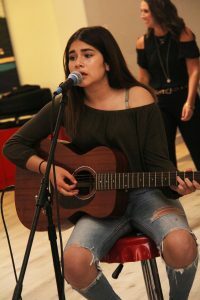 Sophia Guerra performs in the Rolling Rock series during Santa Barbara’s monthly 1st Thursday arts event in 2018. Beyond the shop, there is a large open gallery with more art lining the walls, along with a room where businesses hold training sessions and seminars. Stairs lead to a second level, where volunteers provide services for students who work at YI, including tutoring, business classes, and assistance with filling out financial aid forms for college. Several other rooms are office spaces rented by local nonprofit organizations. Yet another staircase leads to a space that Nathalie Gensac, Founder and Executive Director, plans to build out into more areas for artists to hold discussions and create. Even more impressive than the massive space, is the dedication of every student who participates in the YI program. Twice a week, they diligently show up at the store after school to learn, create, and run a business with their peers. 100% of previous participants earn scholarship stipends from their business profits, and in the last two years, 100% have graduated from high school and gone on to college. When asked how YI stands out from other arts organizations in Santa Barbara County, Gensac says it is a combination of arts and entrepreneurship that makes the organization unique. Although operating a business is a challenge, it keeps the teens engaged. Gensac explains that the key to maintaining that high level of engagement has been listening to students’ wants and interacting with them accordingly. Although the focus on types of partnerships has shifted, YI has built and maintained many strong connections with other local businesses and organizations. This includes the Santa Barbara Bowl Foundation, which will enable the organization to create a music series in 2019 to support area music schools and nonprofits, with a goal to offer a performance space for young artists in Santa Barbara. Another partnership is with Montecito Bank & Trust, a benefactor and supporter that assists students with financial literacy education. 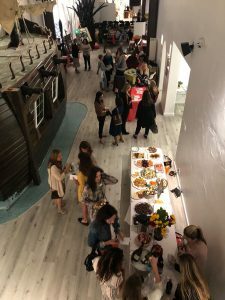 Guests mingle during an event held in the Youth Interactive gallery on State Street. While YI has achieved rapid success in just a few years, Gensac is in no rush to hastily expand the organization’s outreach. The number of teens accepted into the program has remained steady at around 75 to 90, which she says is best to maintain the quality of one-on-one interaction between the teens and YI volunteers. She is also waiting to reach the necessary operational and funding capacity before growing the student numbers in Santa Barbara County and replicating other YI chapters throughout the country. Among the projects Gensac has planned to make a solid blueprint are more community arts events to be held at the State Street location, along with a “mocktail” bar that will employ YI students while they attend college. By continuing employment for teens from high school through college, she hopes this will make a lasting impact on their lives, as well as the community they are a part of. To learn more about Youth Interactive, visit youthinteractive.us.